Tommy Katona (Tamas Katona), born August 15th 1984, was raised in Pecs, Hungary. At the early age of four, the late, great Stevie Ray Vaughan became one of his biggest musical influences. It began one day, while he was watching one of his father’s videos of the Texan legend playing. Tommy’s father, Tamas Katona Sr., is also a great blues guitarist. When Tommy saw his father performing live, it inspired him to pursue music as his path in life. At the age of nine Tommy started playing with his dad’s band and was regarded as a child prodigy. In the mid 90’s, he had numerous successful shows, as well as TV and radio performances in Hungary. 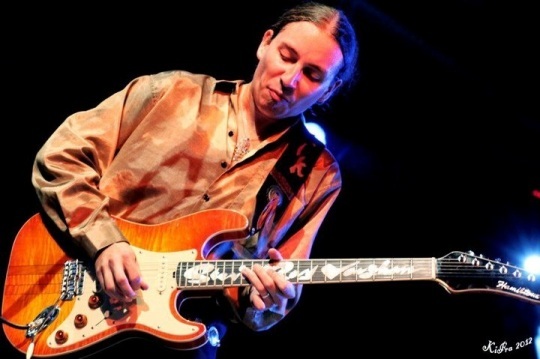 As he was growing up, Tommy’s infatuation with playing the blues developed. One day, Tommy’s dad told him about the sudden and tragic passing of Stevie Ray Vaughan. Tommy then decided to learn more about Stevie’s music and life so that he could follow in his footsteps. During this time he was also studying the music of the old great blues musicians. His inspirations were: T-Bone Walker, Albert Collins, BB King, Buddy Guy, Albert King, Freddie King, Jimi Hendrix and at last but not least his father Tamas Sr. Even though Tommy spent over four years in music school learning to read and write music, he always learns and composes by ear. American blues music, especially Stevie Ray Vaughan’s, highly influenced the young player. A few highlights of his early life were: opening for Mick Taylor of the Rolling Stones, playing with Memphis blues legend Eb Davis, sharing a stage with Muddy Water’s son, Big Bill Morganfield and the great Chicago harmonica player Sugar Blue. Tommy’s big dream was that someday he could go to Texas to play the blues. Just a few years later his dream came true. His first visit to Texas was in 2006. He attended the Stevie Ray Vaughan fan club tour and the SRV Ride and concert in Dallas. He was able to play with local Texas greats such as Wes Jeans, Texas Slim, Jim Suhler, Cheryl Arena and Alan Haynes. After his three week trip to Texas he went back to Hungary bearing many great experiences. Texas was pulling at his heartstrings and he was ready to go back. Meanwhile, Tommy recorded and released his first original album “Let Your Fingers Bleed”. He began touring in the spring of 2007. Tommy and his Hungarian band “Full Blast” were fortunate enough to play at the Puisto Blues Festival in Finland. They had the prodigious opportunity to open for the great Johnny Winter. They also played in Italy and opened for Cyril Neville of the Neville Brothers. After the summer tour Tommy decided to return to Texas to try and start a new life. As an only child it was very hard to say goodbye to his parents. Knowing well this was his only chance to be a successful musician, Tommy’s parents released him to his destiny. Tommy landed in Dallas on October 3. 2007. Stevie Ray’s birthday. A chance circumstance! After living with a close friend for a year and a half, Tommy found the love of his life, Rachel. They got married on September 1. 2009. While in Texas, Tommy played with many musicians and had different musical projects. One more of his dreams came true when he played with Double Trouble bassist Tommy Shannon at the Granada Theater in Dallas! Tommy is available for special one-hour private lessons for $100 per hour, subject to his scheduled availability, please contact the store for available times.